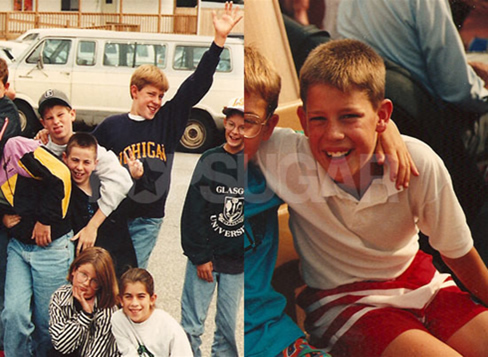 A big ‘ol GMMR shout out to PopSugar.com for sharing with the world these adorable pics of John Krasinski as a youngin’ playing with his friends. Molly from PopSugar grew up with John in Newton, MA (where I happen to live now). Check out these pics and keep your “awwwws” to a minimum. Make sure to head over to PopSugar to thank Molly personally!. Chat LIVE with John Krasinski from THE OFFICE TONIGHT! Oh. My. Gosh. ADORABLE. I wish I grew up with him! Ugh. I can no longer like him. He’s wearing a Michigan Wolverines Sweatshirt. Wow. It doesn’t matter what happens today, that just made my day. lol. Which I realize is kind of sad, but I take what I can get. Ohh and ditto to what Jen said ! Aww Mosby, show some love to the Wolverines!! We’re nice people up here at UofM. 🙂 (Personally, I love that he was wearing a Michigan sweatshirt… just like the one i am wearing myself today). Oh my, I just melted into a pile of goo! The one on the right is so, so sweet. I just want to pinch his cheeks! Molly gets 1 million Schrute Bucks and 1 billion Stanley Nickels for that! Wow, how adorable! I just want to sqeeze him! it’s good to be A MICHIGAN WOLVERINE!